This is the startling conclusion of newly published book, The Rise of the Meaningful Economy. It has been written by long-time Oasis friends and collaborators Mark Drewell and Björn Larsson. Mark and Björn, respectively Senior Partner and CEO of The ForeSight Group, have deployed their considerable intellectual skills, networks and practical knowledge to discover a new narrative of our times. “More people than ever before are seeking to live meaningful lives and expressing that in their economic decision-making. We are changing what we buy and from whom, how and where we work, what we do with our capital and how we design and run our organisations,” said Mark. The book describes how the Meaningful Economy is an emerging megatrend and a new lens through which companies and entrepreneurs can look to create value. 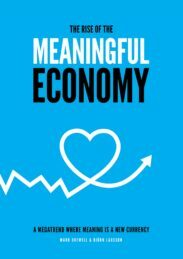 Mark and Björn conclude that for individuals, the Rise of the Meaningful Economy heralds the emergence of an economic system which supports ever more people living meaningful lives through their economic choices. For societies at large it offers the potential for human progress and the accelerated achievement of the UN Sustainable Development Goals. “The Meaningful Economy is a grass-roots development that is changing how the economy functions and what it values – from sharing to localism, to new forms of business design, to new ways of working – it’s a quiet revolution in the making to which we should all pay attention,” said Mark. The Rise of The Meaningful Economy is now available from Amazon.